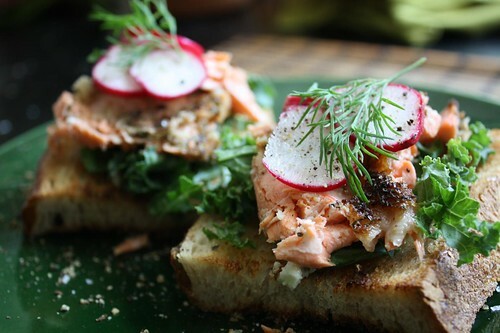 With some old bread, leftover salmon, radishes, dill, and butter I made these toasts for lunch. Tonight Jen didn't get home until after 10:00 PM so we had dinner quite late. The original intention was to use the grill but I've discovered that using the grill that long after sundown is a difficult and dangerous proposition. Luckily it has been unseasonably cool and a combination of stove burner and oven sufficed nicely. My butcher specially cut this piece of USDA Prime for me and it was fantastic. 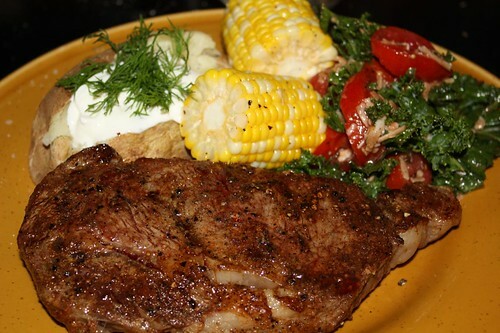 Along with the ribeye I also steamed some corn from corn from Mitchell Farm; baked a potato with sour cream and dill; and made a salad with kale, roma tomatoes from Mountain View Farm, balsamic, olive oil, and shaved Manchego. For wine I opened this bottle of Deep Purple Lodi Zinfandel. I most purchased this one because of the label. I think they're targeting aged hippies and fans of the musical group such as myself. I mean, you'd have to be a fan of the group to really get anything about this bottle. First of all they use a font reminiscent of Deep Purple's. 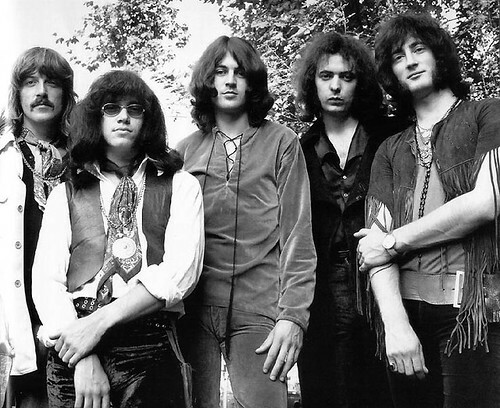 Not good Deep Purple, mind you, but rather The Book of Taliesyn era Deep Purple or Deep Purple Mark I for you fans out there. This is not a look that could at all be associated with the Deep Purple that anyone knows or remembers. This is a look that conjures up images of Rod Evans and Nick Simper. This wine doesn't even try to make you be fooled into a Mark III or Mark IV lineup which actually produced some fantastic music but, in the United States anyway, is largely unknown. No, this is Shades of Deep Purple era, a time where British bands were still trying to figure it out as The Beatles years died down. It was a time when you could have a song on your album titled Why Didn't Rosemary? without a hint of shame. Fruit Bomb - I think this was a song by Jefferson Airplane. Blackberry - What hippies from the 60's now use to communicate with each other on Facebook and post blurry scanned pictures they took at Monterey. Vanilla Fudge - Another band from the 60's. I think they were loosely implying that this is something you'll taste in this wine but that is clearly a lie. They just wanted to see if anyone would remember Vanilla Fudge. Answer: they still don't. Exploding - I thought hippies were supposed to be all about peace and love. Nice & Spicey - Probably the only accurate description of the wine in this list. They should have used a different font to illustrate this point. I suggest Verdana Bold. Monster Fruit - I have no evidence to support that this is a psychedelic band from the 60's who released albums with an 18 minute instrumental on side B. I also have no reason to believe this is not true. Black Pepper - Any wine worth its salt has to claim, somewhere, that there are hints of black pepper. Somehow they missed "cherry notes." I'm sure they were kicking themselves as this went to print. 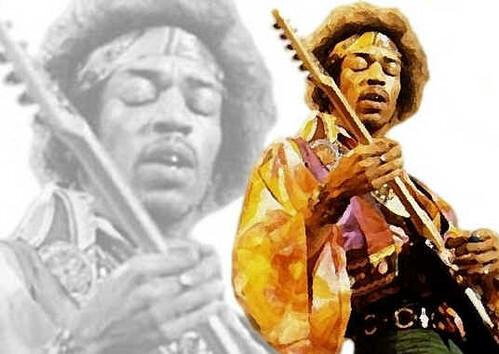 Hedonistic - Reminding hippies of their hayday. Cinnamon & Clover Over and Over - Something that wine snobs (some of whom are former hippies) will tell you they taste in a wine to seem superior to you. Don't worry, they're just lying. The art of being a wine snob is to learn as many of these stupid things as possible. Want to seem like you know about wine? Just tell people you taste tobacco and they'll cover their gaping mouth with the palm of their hand while silently holding you in reverence. Drink Me! With Pizza, Burgers, and Brownies - And this is where it all breaks down. In case anyone was curious what country this wine was made in they need look no further than this line. and, of course, Foxy Lady. 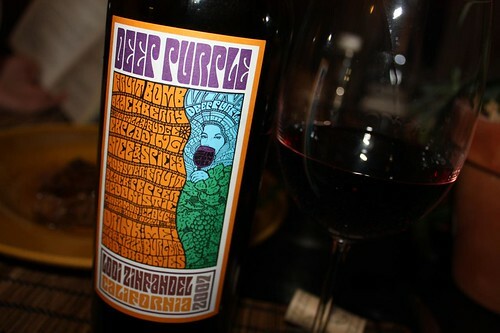 Deep Purple Wines, if you are reading . . . those are free! Get to work on this, please. 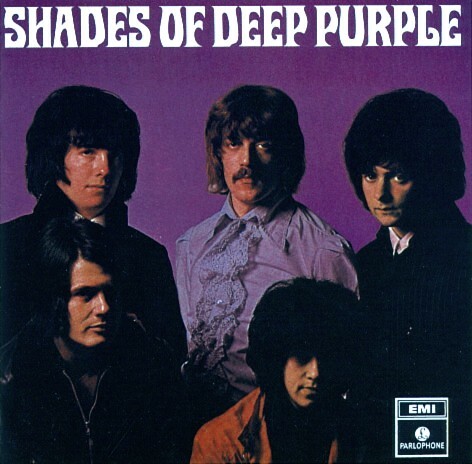 I beleive I might still have the Shades of Deep Purple album lurking somewhere in the basement. And an oblique reference to Tommy James and the Shandells. Do not beleive they have ever been used in the same zip code as anything about Deep Purple. And Vanilla Fudge have one of the best remakes of a Supremes song ever. Which was the reference to Tommy James and the Shandells? Do tell! "Crimson and Clover Over and Over" Tommy James and the Shondells. Bubble gum music is very insidious. By the by, if you ever discvover a wine that channels The Chambers Brothers, I want to know immediately. This is the finest piece of writing I have ever beheld. Up till now it was the episode of The Mighty Boosh where the Spirit of Jazz's hat catches on fire, but that has been surpassed.